Tired of the shopping frenzy? Looking to reduce the carbon footprint of your gifting? Consider making a gift in honor of your loved ones as a way of sharing the Joy of the Salish SEAson. Join us as we welcome Todd McLeish, who will present his latest book on narwhals (also known as sea unicorns) titled Narwhals: Arctic Whales In A Melting World. Learn more about Todd McLiesh's book at toddmcleish.com. Look what the storm brought in! My new friend and I go for a truck ride. 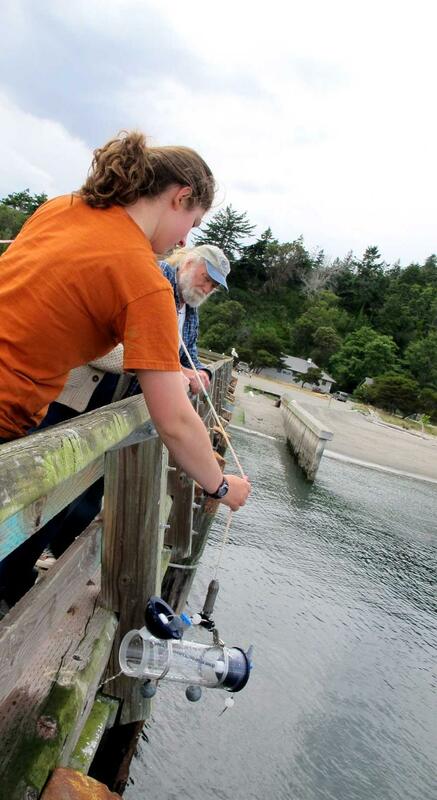 Life at the Port Townsend Marine Science Center is largely unpredictable, and often chaotic. Inspiring conservation of the Salish Sea is a BIG job and it turns out there are A LOT of ways to do it. Today I helped save a seabird and I'm writing this blog to inspire you to save future ones- and their homes too. This striking penguin-like seabird in my lap is a Common Murre. Earlier today a woman braved the wind and rain to bring the bird to us in hopes we would be able to help. She had found him (or her) on a nearby beach, unable to fly and looking tired. We have no idea how to care for birds, but we know someone who does! We called our friend Cindy Daily at Discovery Bay Wild Bird Rescue (360-379-0802), who's always eager to save a feathery friend. While we waited to hear back from Cindy, Chrissy and I went about finishing up our tasks. 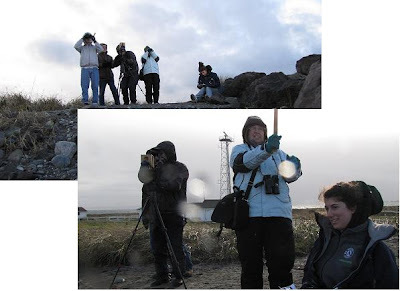 After all, we had not allotted time in our schedules for bird-sitting and still had to clean up after a day full of harbor seal necropsies (more on that later). We planned to leave the bird in a box lined with a comfy towel, but he kept poking his head out the top and attempting to escape. It was time for Plan B. I tucked him into my jacket and whispered sweet nothings to him as I went about putting things away. Too soon, Cindy called and it was time to bring my new friend into rehab. We met at the Safeway parking lot to make the exchange. I fought back the urge to ask 'can I keep him?' (it wasn't easy). Instead, I asked what she thought had happened, since I couldn't see any obvious injuries. I was startled by what she told me. On windy days when the seas get really wavy, contaminants in the water get stirred up. 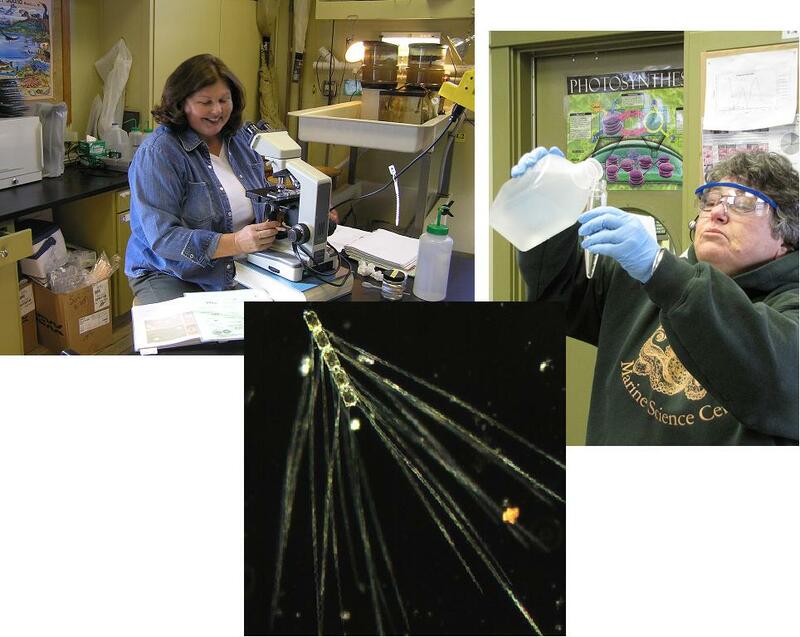 Some types of contaminants, like petroleum or vegetable oils, destroy the insulating capacity of bird feathers. If a seabird like our Common Murre swims through an area with these types of contaminants, they risk death by hypothermia because they can't keep warm. Sometimes a 'de-insulated' seabird winds up on shore, usually cold and exhausted. However, with time, food, and TLC, rehabers are able to save these birds. But only if people bring them in! If you suspect a bird is 'de-insulated', capture it! It should be fairly easy. Use a towel, blanket, or jacket to cover him up and keep that sharp beak away from your eyeballs. If the bird flies away at a million miles a minute, it probably wasn't de-insulated. Put the bird in a box. Call Discovery Bay Wild Bird Rescue at 360-379-0802. You could do this first if you are unsure what to do in-the-moment. Of course the ideal solution to this problem would be to remove all of the troublesome contaminants from the ocean so that seabirds (and everything else) wouldn't be threatened by their presence. Maybe that's not possible, but it's sure worth shooting for. Farewell wild one. I forgive you for jabbing me. Baby steps. Today we helped save a seabird that had been hurt by something people did. Sure, it's not a big difference in terms of the Salish Sea, but it's a big difference for this bird. Thinking about the small things we accomplish on a daily basis allows me to sleep peacefully at night. I have high hopes for our little black and white amigo. Thank you mysterious lady who brought him in, huddled in your blanket. You've inspired me! *Special note: Cindy Daily is a licensed reahabilitator. It is illegal for the general public to posses a wild bird except for short-term care prior to transporting it to a rehab facility. Here's a pigeon we brought to Cindy's rehab center a couple weeks ago. He had an injury to his neck and crop, but is recovering nicely! 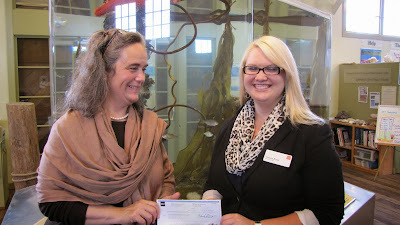 Kathryn Gifford, manager of the Port Townsend US Bank, presents a check for $2,500 to Janine Boire, the new executive director at the Port Townsend Marine Science Center. This grant from the US Bank Foundation funds the Center's Free Science Classes that benefit over 700 fourth and fifth graders from the North Olympic Peninsula. Students travel to the PTMSC to get their hands wet in the Salish Sea, meet some of the creatures that live there, and get fired up about science. Try your hand at being a scientist. Learn why we measure things such as pH, salinity, dissolved oxygen and nutrients in the water. Drop in or stay as long as you like. More sessions will be scheduled for July, August and into the fall. Check back for dates! During opening circle last Monday for Marine Biology Camp, when prompted to state one interesting fact about yourself one young man set the tone for a wonderful week when he said, “my name is Cort and I like to stay positive,”. Again and again we counselors were impressed by the enthusiasm, intelligence, joy, and humor that the 32 nine to thirteen year olds demonstrated throughout the week. We started off learning about invertebrates, visiting the Marine Exhibit, and fish printing their camp shirts. Although they struggled to pronounce “Echinodermata” during invertebrate class, many of the campers were excited about exploring the touch tanks. Real fish were used to print colorful patterns on their shirts and many of the campers produced their own unique design. Tuesday the kids arrived energetic and ready for a day in the tide pools. 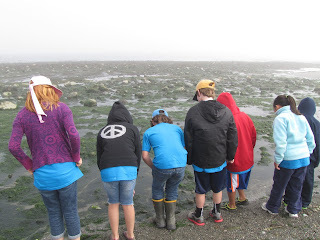 We bundled up against the fog and explored the intertidal area near Point Wilson. The campers braved the slippery algae covered rocks to reach the lower intertidal, home to numerous invertebrates and fishes. Exciting discoveries included a hairy helmet crab, umbrella crabs, numerous sea cucumbers, big red rock crabs, brittle stars, gunnels, cling fish, and more. Although after lunch Plastics class was not a favorite, the lesson clearly hit home as the campers combed the beach to find trash. The most diligent embarked on a “nurdle hunt” in which they searched through the upper layer of sand and plants looking for tiny plastic beads that are melted down to make plastic. On Wednesday morning the signs of a busy tiring two days were beginning to show which meant we counselors were doing our job! This day was a favorite for many campers and staff alike. In the morning we split into two groups and half of the students returned to the marine exhibit to learn about, and sketch fish, while the other half peered into microscopes to study and learn about plankton. Afterwards the two groups switched. Amber’s fish talk had many of the kids in peals of laughter and numerous individuals cited the plankton class as their favorite learning activity of the week. In the afternoon we set out to build a whale to scale! 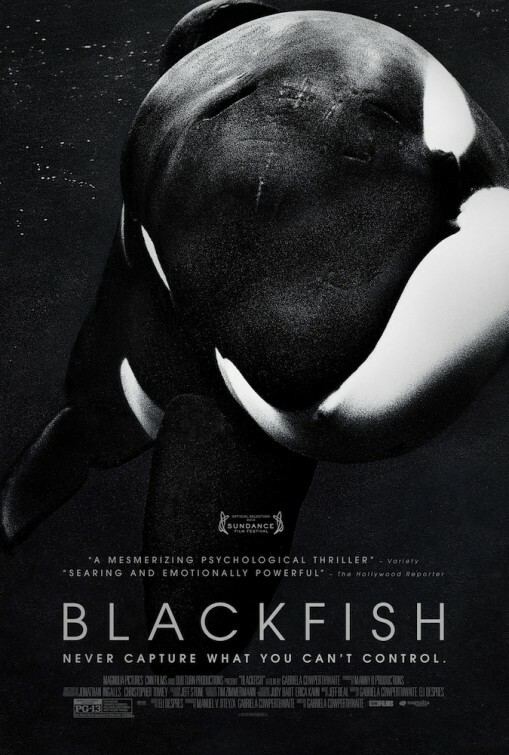 After a vote the Orca won by a large margin over other local whales. Various teams such as artists, water collectors, and sand collectors began the task of constructing the 25 foot marine mammal. After a hectic start many of the workers formed a group which involved a dedicated team of diggers, an eight person line of bucket passers and bucket dumpers, and a small group of sand squishers, shapers, and smoothers. It was a truly exciting sight to watch the 32 kids work in an organized team. In the end they produced a marvelous sand whale with a surprising likeness to a real orca! Thursday involved a bit of travel on the public bus system with all of the campers. Although we filled every seat on the bus the transit went smoothly and we were delivered to the tide flats near the boat yard. The morning was foggy and the tide flats stretched out ahead of us at low tide full of promise. There we set up four stations: one for journaling, the next for checking out animals caught in a seine net, the third for digging up worms, and lastly a station for digging clams. Although all of the animal oriented stations were popular, the clam digging station stole the show. 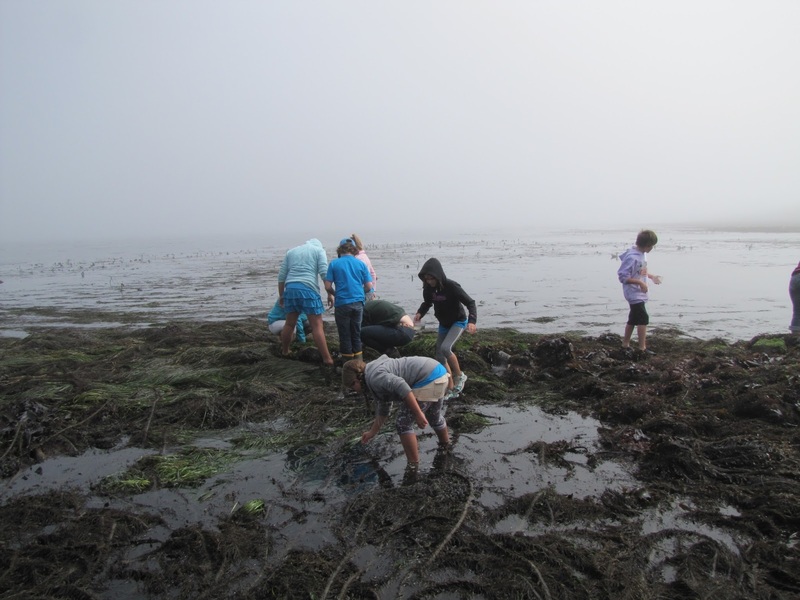 The record for clams unearthed in one 20 minute rotation was 36! We culminated Marine Biology camp on Friday with a Marine Birds class as well as a Fish Dissection class. Both classes were popular albeit the herring dissection was not popular with everyone. In the afternoon we unleashed the 150 foot long seine net and examined (in a large plastic pool!) the variety of fish and invertebrates we caught. Although small Dungeness crabs, surf perch, and soles dominated the sample, more unique finds included juvenile salmon, buffalo sculpin, various gunnels, and silver spotted sculpin. Overall Marine Biology camp was a phenomenal mix of learning and fun. Many campers and parents expressed how much they loved the camp. First timers and repeat campers alike were already making plans to come back next year. Dates are currently being worked out for next year so keep an eye out on our Facebook page and website for more information! The PTMSC offers a 6-hour sailing adventure to the Protection Island National Wildlife Refuge aboard the 101' historic schooner, Adventuress. On this cruise you can help the crew sail this historic vessel while enjoying a leisurely tour of the wildlife sanctuary. As on all our cruises, a Marine Science Center naturalist who knows the island very well will help you see and appreciate its wildlife. or $75 for members of PTMSC, Audubon, Burke Museum or Washington Ornithological Society. Our Marine Mammal Stranding Network recently received a call on our message-line from a woman reporting that a seal pup was on a busy beach in front of her house. She was worried that the seal pup had been abandoned by its mother and wanted to know what she could do to help. I could tell by her voice that she was very distraught and fighting tears. Her story has a happy ending, but you'll have to read it for yourself! The short story that follows is one she wrote and kindly sent to us. I wanted to share it with you because I know there are others out there who can relate to Gayleen's experience. When a stranded baby seal pup mysteriously appeared on our beach last Tuesday afternoon I called every emergency number on the planet until I was led to Danae at the Port Townsend Marine Science Center, in charge of monitoring baby seal pups. Danae explained how important it was that I follow the hardest advice imaginable: protect and guard the area with signs, watch the pup and... whether its mother returns from her feeding and carries it to safety or not and it dies, I could do nothing except hope, wait, and watch. It looked so vulnerable looking out at the water and crying for its mother, just lying there waiting for her to return. Only 50% survive. At sunset Wednesday night and still no signs of its mother as it waited facing the ocean and crying, I watched an eagle slowly circle the baby pup, and remembered her words, eagles depend on pups for nourishment. I could not intervene. Thursday morning when I forced myself the courage to check for his tiny body, he was gone! No signs of a struggle, he was gone as secretly as he'd appeared. Wherever you are, Mother Seal, thank you. And, a special thank you, Danae, for your guidance and compassion. Thank you Gayleen for sharing your story! Seal pup season brings a mixed bag of emotions. The babies are undeniably adorable with their big eyes and furry little bodies, making it impossible not to fall in love. Watching them wiggle around on the beach is both cute and hilarious. But there is a dark side to the seal pup season... as Gayleen mentioned in her story above, only 50% of harbor seal pups survive their fist year. Harbor seal populations have recovered to a healthy number, thanks to the Marine Mammal Protection Act, but that does not mean it is easy to handle the loss of a seal pup. So what should you do if you encounter a seal pup on the shore? The best thing you can do is give the animal space. Mothers often leave their pups on shore to rest. Adult seals are wary of people, so mom will wait until all disturbances are gone before reuniting with and nursing her pup (Gayleen waited two days!). Encourage people to "Share the Shore" by staying back 100 yards, if possible. Do not attempt to move, feed, pick up, or pour water on a seal pup. Please call the PTMSC Marine Mammal Stranding Network at 360-385-5582 x 103 for guidance or to report a dead, injured or stranded marine mammal. The National Oceanic and Atmospheric Administration (NOAA) recently released a short, two-page flyer with FAQs about harbor seal pups. It is loaded with great information (and is free of scientific jargon). To view the flyer please click HERE! You can put the flyer on your refrigerator, share it with your friends and relatives, enclose it with your holiday cards, or have it screen printed on your t-shirt or pillow case. Whatever method you choose, please spread the word about harbor seal pups. Enjoy those sandy beaches and rocky tide-pools this summer and remember to Share the Shore!